In this lesson, students will attach their Raspberry Pi to a network so that they can create a multiplayer Minecraft session. This lesson leads nicely into the next session in which students learn to program in Python using Minecraft Pi edition. After about 20 minutes or so of playing around, invite the students to the front of the class and explain to them that they are going to network their Raspberry Pis. Explain that the IP address can be either entered in manually or can be configured automatically using a Dynamic Host Configuration Protocol (DHCP) Server. Explain that, because most routers have a built-in DHCP server, the router will automatically assign a unique IP address to each of the Raspberry Pis once they are connected to the network. Ask the class what they think the benefit are of using a DHCP server – look for answers such as “You don’t have to manually assign the IP address for every device on the network” and “The DHCP will ensure that every device has a unique IP address” etc. Note: All modern routers should have a built-in DHCP server and this service will normally be turned on by default. The Raspberry Pi will automatically send out DHCP request as soon as it is connected to the network and therefore should be assigned an address automatically without any user intervention. Extension: At this point, you could also discuss other significant network terms such as default gateway, subnet mask, broadcast, DNS, MAC address etc., however, this is not necessary to complete this lesson. Next, give each student a CAT 5 lead and ask them to connect one end to their Raspberry Pi and the other end to a spare port on the Router. Once the students have done this, instruct them to test if their device has successfully connected to the network by checking to see if it has a valid IP address. 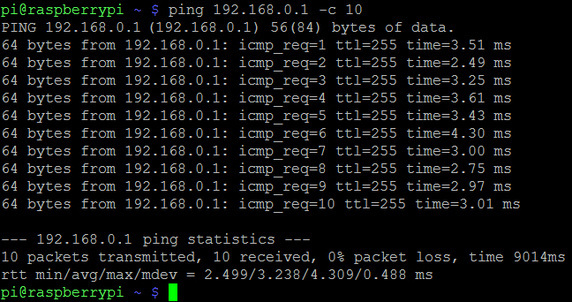 This image above shows a ping between a Raspberry Pi and the router which, in this case, has an IP address of 192.168.0.1 The –c 10 option sends 10 packets and the echo replies are shown above with the time taken. Finally, once all the students have successfully networked their Raspberry Pis, ask one of your students to launch Minecraft Pi edition on their Raspberry Pi and start a new game. Once Minecraft has loaded, ask the rest of the class to also launch Minecraft on their Pis however, this time, to “Join Game”. Finish the lesson with a bit of Multiplayer Minecraft! http://pi.minecraft.net - Installation instructions and download link for Minecraft Pi edition. http://www.ocr.org.uk/qualifications/by-subject/computing/raspberry-pi/ - OCR Raspberry Pi: Getting started tutorials. http://www.raspberrypi.org/help/quick-start-guide/ - Raspberry Pi quick-start guide. http://www.stuffaboutcode.com/2012/05/raspberry-pi-setting-static-ip-address.html - How to setup a static IP address for your Raspberry Pi.